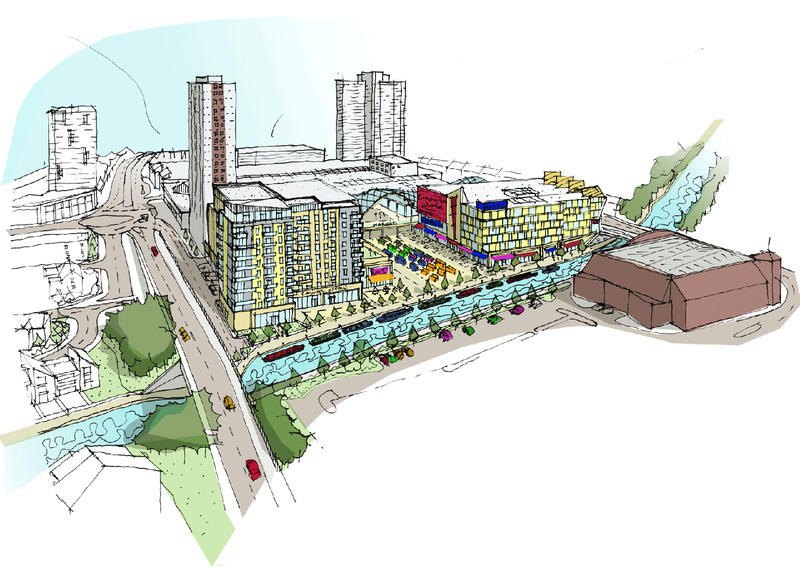 Revive 1960s shopping centre and canal frontage with retail, leisure, and residential. Unlock the Sefton masterplan with the revival of the 1960s Stand Shopping Centre through a mix of new uses and enhance retail, and by opening up the potential to connect with the canal. A vision for the revival of the 1960s Strand Shopping Centre in Bootle, Liverpool by opening up the scheme to realise the potential to create new frontage and public space on the canal frontage. In doing so this will unlock the wider Sefton masterplan to regenerate the canal and existing town centre. The scheme will see the centre expanded with 150 new 1 bed and 2 bed dwellings that overlook the canal, and associated parking. The existing retail will be updated to reflect modern trends, with an additional 31,000 sq. ft of retail created. The ground floor will feature a new covered market. The canal side creates an opportunity for outdoor dining with 22, 500 sq. ft of restaurant space created. This will enhance the nigh time economy of the areas and complement other proposed leisure uses such as a 5-screen cinema; gym and 90 bed hotel. The scheme presents a great opportunity to revive the derelict canal side with enhanced public realm proposals that will tie the scheme together and into the surrounding context. The scheme will exploit the opportunity for leisure traffic using the canal by providing new berths, welfare and maintenance facilities for narrow boats.